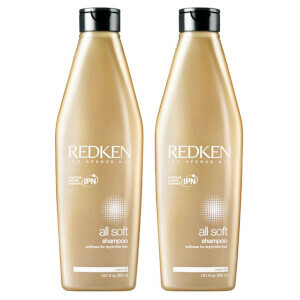 Add a finishing touch of pure silk with Redken All Soft Conditioner, the perfect accompaniment to All Soft Shampoo. The complex formula smoothes and detangles, minimising frizz and leaving you with sleek, healthy looking hair. Formulated with Silk-Luxe Complex, Redken All Soft Conditioner contains a unique combination of ingredients to add luminosity and lustre. Argan Oil restores moisture and provides replenishment, intensely conditioning your hair leaving it silky smooth. Redkens unique Interbond Conditioning System combined with Silk-Luxe Complex will give your dry or brittle hair a renewed texture and strength to leave your locks beautifully sleek and with a brilliant shine. The conditioner itself is not bad but it is a struggle to get the product out of the bottle. Makes my heat-styled, coloured, slightly frizzy hair more manageable every day. Smells lush and you only need a little - a product with zero drawbacks! This product makes your hair feel like silk and I have pretty damaged hair. Great value on this website too. 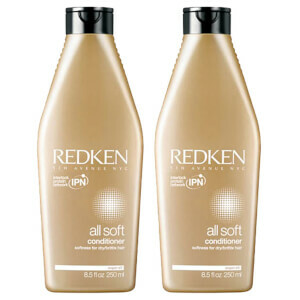 I've been using Redken products for 15 years now and ALL SOFT conditioner is one of my fav. It leaves my long and a bit dry hair feeling soooo soft, silky... almost moist like and it is an amazing detangler- hair glides easily through fingers until next wash. AAAND- the smell is so good, I'd use it just for that. this is the best conditioner i have ever used, it may cost more than the average but it is so worth it. 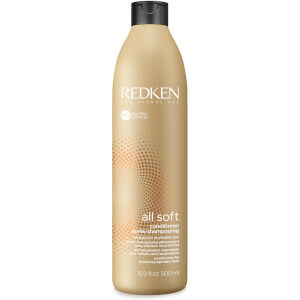 I have fine, frizzy/curly hair and its very sensitised as I have bleached highlights around the top and it it very prone to snapping but once i have used this conditioner with the shampoo it feels different from the very first wash. Also I had more highlights in over christmas and in areas it was weak and snapping so i purchased the Redken Extreme CAT and used it once a week on the fragile bits, this is a must if you have hair like mine slightly damaged and weak. Give it a go i promise you will be happy with the results. Tried this conditioner for the first time and loved it! My hair is very long (below waist) so obviously need a lot of care and this product was perfect to me. Nearly finished and this time will order to try Conditioner and Shampoo together. One down side for this conditioner it is so difficult and not comfortable to use, really should consider to redesign bottle..
Good professional-quality product to use at home gives excellent results. The only problem is that due to its thick consistency, it is often difficult to get out of the bottle, especially as you get into the last half. Great company! 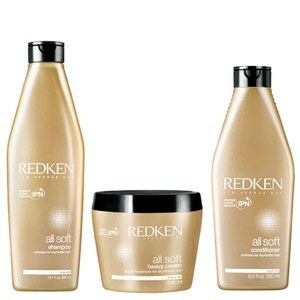 Get my redken here every time, fast delivery and great prices ! This is so far the best conditioning to my curly hair. I am with love with this product!